At least it’s clear who’s setting the agenda at this weekend’s meeting of Provincial and Federal Ministers of Energy and Mines. It turns out the Canadian Association of Petroleum Producers and the Oil Sands Developers Group are the major sponsors of the annual meeting of energy and mines ministers in Kananaskis, Alberta. On the agenda is Canada’s energy future and the path towards a national energy strategy. It is unusual to allow any corporate sponsorship of these meetings, never mind to the tune of nearly $200,000. The last energy ministers meeting held in Western Canada in 2008 received a total of $3000 from one corporate sponsor, and when the ministers met last year in Montreal the organizers chose not to accept any funding from the private sector. In contrast, oil companies are bankrolling this weekend’s meeting to the tune of $180,000, roughly 1/3 of the entire conference costs. 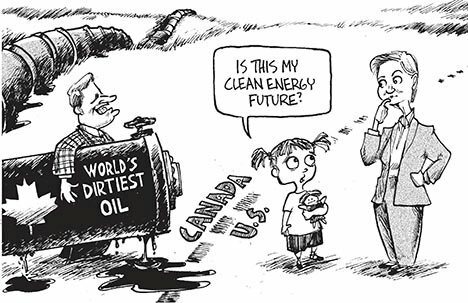 In the second decade of the 21st century, Canadians are facing a choice between an energy future built around a rapid expansion of the Alberta tar sands and an alternative vision that would serve all Canadians (not just those with investments in the tar sands), one that would make Canada a leader in clean energy and ensure that Canada does its fair share to reduce global warming pollution. What are the chances that a clean, renewable future will be chosen when this meeting is paid for by Big Oil? Take action – David Suzuki Foundation: Tell your energy minister to stand up for a clean energy future. Better yet, after you’ve sent an email, pick up the phone and call your energy minister and tell him you’re not happy that Big Oil is setting the agenda for Canada’s energy future. ← Does Life Get Better Than Fresh Strawberry Pie? Yep, they’re not even bothering to hide the close ties any more….